Some online retailers have begun taking pre-orders for Intel’s nifty-looking Compute Stick, a device that turns big displays into a Windows or Linux computer. The Compute Stick, introduced in January at the Consumer Electronics Show in Las Vegas, is just one way the chip maker is looking to expand its product lines. Weighing less than two ounces — four inches long by half an inch thick — the Compute Stick plugs into a TV or display’s HDMI input. Like other streaming media dongles, the Stick has built-in Wi-Fi, but its Bluetooth support lets you add a keyboard and mouse. Also on board: a quad-core Intel Atom processor, 2 Gigabytes of RAM, 32GB of storage and a micro SD card slot for additional storage. Intel (INTC) had priced it at $149 for the Windows 8.1 model and $89 for the Linux model. Retailer NewEgg listed the product as being available April 24, as Cnet.com noted earlier today, and Amazon lists the product, too. 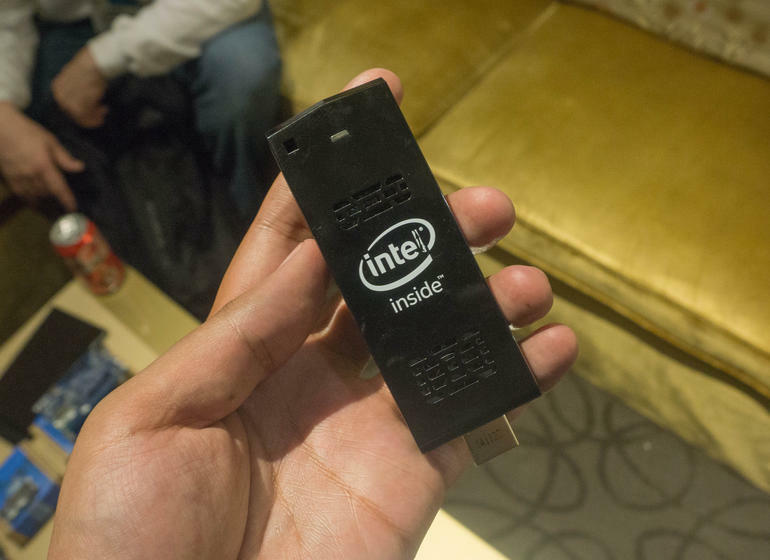 Intel, however, did not have additional comment on the Compute Stick’s availability. Interest in the snazzy product would be a boon for Intel. Last month, the company announced that first-quarter revenue is expected to be about $1 billion less than previously expected, $12.8 billion, plus or minus $300 million. When its quarterly earnings are released on April 14, Intel will revise its reporting to include the Client Computing Group, a combination of the PC Client and Mobile groups. By merging those groups, Intel can “essentially hide its massive losses for the segment,” a $3.15 billion operating loss in 2013 and $4.2 billion in 2014, said Bill Maurer on the Seeking Alpha investment news site.